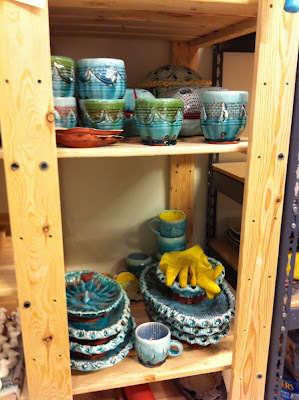 This past Sunday the members of Boston Handmade held our annual meeting. Each year we meet in a new location and discuss events of the year past and plans for the year ahead. This meeting is an all day retreat with pot-luck delicacies, vibrant discussion, and time spent with friends. One of the most anticipated moments during this day is the annual gift exchange. Members of Boston Handmade tend to be extremely busy during the holiday season, so we hold our annual meeting in January and bring a small, handmade, wrapped gift that will be blindly chosen by another group member. Oh the anticipation! 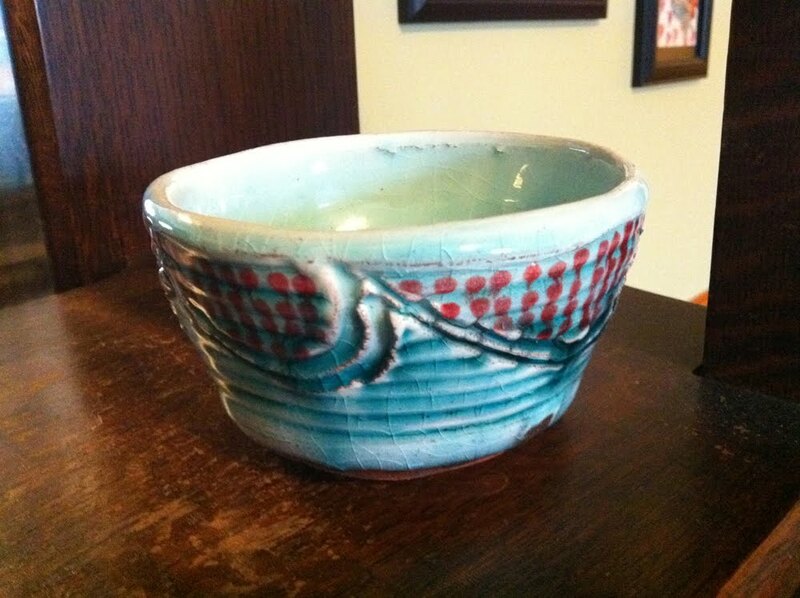 This year I was thrilled to receive a ceramic bowl, pictured above, made by Arthur Halvorsen. This gift, on this day, was especially exciting because our meeting was hosted by Arthur and held at Mudflat Studios in Somerville, MA. Mudflat is Arthur's "home away from home" as he is a Resident Artist there. The studios are housed in a stunning, newly renovated building. The view in the photo above is taken looking down from the "grand staircase" in the center of the space. 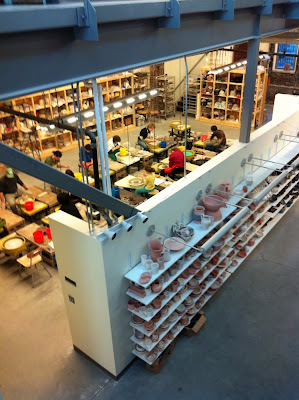 In this photo you can see a class being taught, and long shelves holding many, many beautiful pots waiting to be fired. Part of the thrill of seeing the facilities at Mudflat was getting a glimpse into Arthur's private studio space. 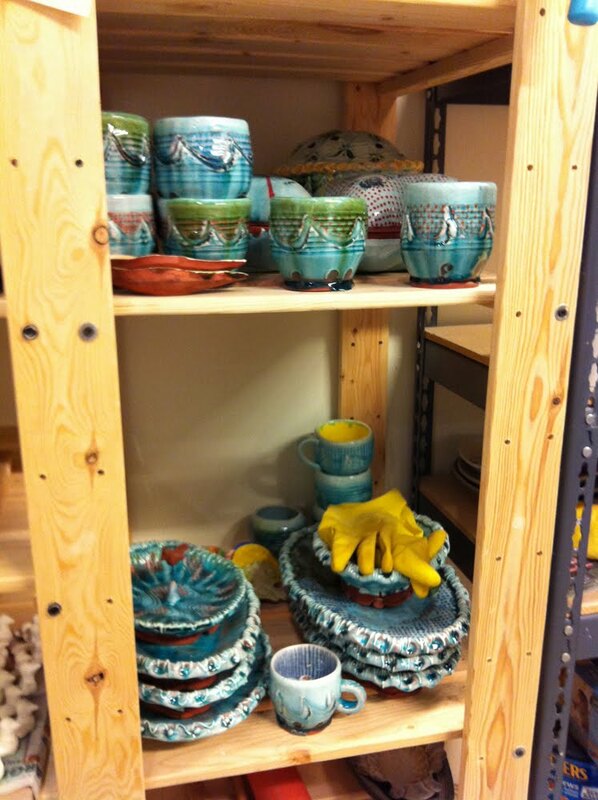 The photo above shows a collection of his finished pieces on shelves in his studio. Kerry Hawkins put together a photo essay about the visit to Mudflat. Lucie Wicker wrote a blog post about the silk screened t-shirt she received in the gift exchange from Evan Webster. Allison Fraske posted a photo from Mudflat on her new blog DailyLovely.